How many times have you wished you had someone helping you walk through the pickling process? I am always wondering if there’s another way to pickle, can, and preserve! 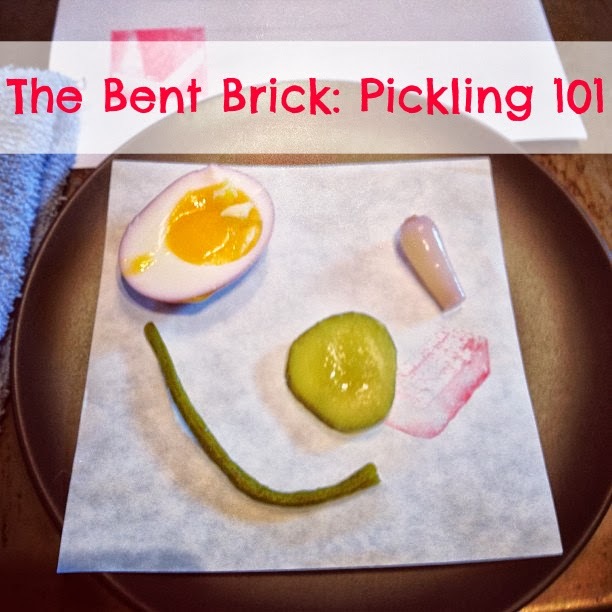 I recently participated in a Pickling Class with William AKA Zuzu with The Bent Brick, and it has since opened up a whole new world of super easy refrigerator pickles (and by pickles I mean….pickles, green beans, jalapeños, YOU NAME THE VEGGIE–I can now probably successfully “pickle” it). This evening in particular we made Bread & Butter “Pickles” (green beans) with turmeric, which is what gives any of the pictures you might see that rich yellow color. The class lasted an hour an a half and in that time we got a nice walkthrough of the history of pickling as well as a tour of The Bent Brick‘s upper kitchen area and a run through of the entire recipe. To keep us from going home empty-handed, Zuzu gave us each a quart jar of the finished product, reserving what we had made for the next class. This class was not only super informative for me, a novice pickler, but it also made me think about the way I had been pickling and how much I don’t mind keeping my pickled creations refrigerated because it means I get around to them much sooner (as my dilly beans from last summer scream to me from my kitchen cabinets). Especially if one is pickling cucumbers, refrigeration pickling really is the most ideal option for preserving crispness. I wanted to share my recipe from that night! Bring all of the ingredients except the green beans to a boil in an non-reactive (aluminum or stainless steel pot). In the meantime, trim the ends of your beans, make them nice. Place the trimmed beans into your very clean containers (I like to run mine through the dishwasher first to ensure cleanliness). Place them nicely and not too tightly so that they will be covered completely by the brine. Once the brine has come to a boil, pour it into the containers so that it completely covers the beans. Allow the brine to cool to room temperature before covering and putting into the refrigerator. Check out more classes and delicious eats on The Bent Brick‘s website!